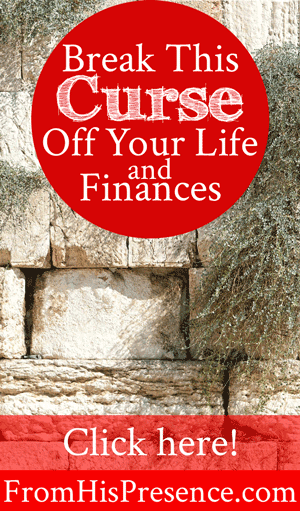 Do you want to break every single curse off your finances, so you can be blessed? Yes? Good! Because today, we’re going to break the curse of replacement theology off your life. In this post about the sixfold blessing of the tithe, we discussed the first step to becoming very, very blessed in your finances–and how to break a literal curse off those finances at the same time. Today, we’re going to talk about how to break the second curse off your finances. Did you know that there is a second curse many Christians have brought on their finances–and many of them don’t even know it? True story! And it’s a curse that’s SO powerful, it just paralyzes you and your WHOLE LIFE. That’s right; it’s not even limited to impacting your finances. It will impact everything about your life. If you’re an awesome artist, have you ever had someone tell you that you can’t draw or paint? If you’re a wonderful organizer, have you ever had someone tell you that you AREN’T gifted in administration? If you’re a super musician, have you ever had someone tell you that you sound awful on your instrument? Has your spouse told you that you’re not a good wife/husband, when you actually are? Have your children shouted at you that you’re a terrible parent, when actually you’re a good parent doing the best you can? Those things hurt, don’t they? It stinks to be told that you’re not something when you actually ARE that thing. I’ve had people curse me like that many, many times. It hurts really, really bad. I know. And if that’s happened to you too, I’m really sorry. Why does that stuff hurt so badly? Because those statements are actually word curses. Yes, that’s right. When someone tells you that you aren’t something which you actually are, they are pronouncing judgment on you based on a lie. They are actually speaking a curse over you; and, unless you verbally reject that curse, refuse to come into agreement with it, and pray it off, then you will be impacted by that curse. ‘Get out of your country, from your family and from your father’s house, to a land that I will show you. I will make you a great nation; I will bless you and make your name great; and you shall be a blessing. I will bless those who bless you, and I will curse him who curses you; and in you all the families of the earth shall be blessed'” (Genesis 12:1-3). When God sent Abram–who later became Abraham–out of his homeland and into the land of promise, God spoke a blessing over him. He also promised to CURSE anyone who cursed Abraham. Why does this matter? Because there’s an unbiblical belief going around the Church today that says the Jewish people–Abraham’s children of promise, through Isaac–are NOT God’s covenant people. The people who believe that the Jewish people are not God’s covenant people say that the Church replaced the Jews in God’s covenant. It’s called “replacement theology,” and it’s a lie that Satan came up with in order to steal from God’s people. The devil wants to kill you and rob you of your blessings. He wants to rob you of the blessings Christ died to give you. He wants to prevent you from ever GETTING those blessings. He wants to rob you of your health, your wealth, your children, and every other good thing. And getting you to succumb to the lie of replacement theology is one of the biggest ways the devil does it–because he knows that GOD Himself will curse you if you will just succumb to this one lie. If you have ever in your life believed or said that the Jewish people are NOT, still, God’s covenant people, then you have a curse on you. Believing or saying that God’s people are not something they really are curses them. And God said that, if you curse Abraham, He Himself will curse you. I don’t think you want that; do you? The covenant God made with Abraham was not a conditional promise. We don’t even know that Abraham knew God when God made this covenant with him. God simply came to Abraham one day and said, “I WILL.” He made the administrative decision that X and Y and Z, as outlined in the covenant, were simply how it was going to be. That’s why it was a covenant, not a promise (as promises usually carry conditions). The covenant God made with Abraham was an eternal one. An eternal promise to make Abraham a great nation; to bless him and make his name great; to bless those who bless him; to curse those who curse him, etc. And Abraham honored God because of the covenant, but many of his descendants didn’t. The Bible is full of story after story about how Israel loved God, then stopped loving Him. They were faithful to God, then they cheated on Him with idols. This broke God’s heart over and over, but He didn’t abandon His kids. That’s why He told the prophet Hosea to go marry a prostitute … then to go find her and take her back when she cheated on him. Through Hosea, God was showing the world a picture of how faithful He is to His covenant children, even when they were unfaithful. But He did use the situation to His advantage, to work everything out for His–and our–ultimate good. When His people were unfaithful to Him, Scripture records that God did something about it. Yes, He disciplined them; but He also took a trick out of His sleeve that defeated the devil. God always has the last move! “My people don’t want Me right now. I’m going to let them have their free will, but I’m going to work it all out for the best in the long run. In order to work it out for good, I will add additional people to this covenant who DO want Me. I have the legal right to add more people to the covenant since these people don’t care about it! So now, I rule that anyone who puts their faith in My Son Jesus will be grafted into My covenant. Ha ha ha … this is going to be great. Because when I add all these other people to My covenant, it will make the Jews jealous. When the Jews get jealous, they will return to Me and will confess My Son Jesus as their Lord too. That way, ALL the people on earth who want Me can have Me, through My Son; and they can ALL have the benefits of the same covenant. This article is not intended to be an in-depth treatise on the covenant God made with Israel. If you want to learn more about this, read the books of Romans (particularly chapters 9-11), Isaiah, and Hosea. You will see exactly how this worked if you do. And beloved, you MUST study this out for yourself. At least read Romans 9-11 if you haven’t read it in regards to this subject, okay? So the point is: Israel is still God’s covenant people. They have been since God spoke to Abraham, and they always will be. Just because we Gentiles who believe in Christ also get to enjoy the benefits of the covenant doesn’t mean that the Jews have been replaced. Father simply added more children, because He had the legal right to do so since His original children stopped loving Him. But now, in Christ, all God’s children–Jew and Gentile alike–can eventually become one big happy family in Him. The Jewish people must still accept Jesus Christ as their Savior and Lord, just like we must. And many of them have. There are many Messianic Jews in the world–Jewish people who claim Christ as their Messiah and believe Him for salvation from sin. But many, many more will still be saved. And the witness of the Christian Gentiles is the catalyst God is using to reveal His Messiah, Jesus. That’s why we must pray for Israel. That’s why we must witness to them and take care of them, for it’s the goodness of God that brings men to repentance. But make no mistake: if you believe or say that the Jewish people are NOT God’s covenant people, then you are cursed. There’s no easy way to say that, beloved. It’s Biblical truth. You shall know the truth, and the truth shall make you free. The good news is: you can easily break this curse off your life and finances so you can be blessed. Verbally confess to God that you have believed the enemy’s lies and have not agreed with His Word about the place the Jewish people have as His covenant people. Verbally renounce agreement with replacement theology and with every curse against the Jewish people you have ever believed, heard, or spoken. that the Jewish people will eventually be saved through Christ because of our faithful witness for the Savior. Ask Father to forgive you for cursing His people. Ask Him to cover you with the blood of Jesus and wash you clean. Ask Father to fill you with His Holy Spirit. Now bless the Jewish people. How do you bless the Jewish people? For the sake of my brethren and companions, I will now say, ‘Peace be within you.’ Because of the house of the Lord our God I will seek your good” (Psalm 122:6-9). After that, I encourage you to sow a physical seed of blessing into the Jewish people. Remember that God said “I will bless those who bless you,” so it’s not enough to just make it onto neutral territory. You must also bless God’s people. To sow a seed, I would encourage you to find a charity that sows into Israel, does humanitarian work in Israel, and supports Israel in current events (such as Abba’s House Media, Curt Landry Ministries, or Perry Stone Ministries). Sow into the Israeli-focused charity of your choice. And, from now on, for the safety and salvation of the Jewish people. Beloved, when you renounce replacement theology (which is, frankly, anti-Semitism), and BLESS the Jewish people, then God can bless you. He breaks the curse off you as soon as you come out of the conditions of the curse. And He blesses you as soon as you line up with His requirements for blessing. Have you been guilty of believing that the Jews are no longer God’s chosen people? If so, will you kick the devil to the curb today, following the steps listed above? You’ll be blessed if you do. Christine, your comment has been deleted by admin. Please refer to our comments policy here. Thanks. Thank you for sharing.This really blessed me. Just a thought as I am reading this and I pray it will come across clearly. Some people say that we are no longer expected to tithe because we are no longer bound to the law. Some say we are to tithe, citing that Abraham gave 10 percent prior to the law ever being implemented. If we are to tithe based on this logic- because Abraham gave 10 percent, why would we not think that we should reap the benefits that Abraham reaped? I think the answer is that we should reap those benefits? Just thinking here! We absolutely should and do reap the same benefits when we tithe. And we are entitled to the same blessings of Abraham in Christ. I had always heard that a causeless curse would not prosper, but the things people say really do hurt. I will speak them off from now on. And I knew the Jews are the chosen people, our testimony should provoke them to jealousy in a good way and graft them back into covenant with God. Yes, don’t let anything that’s not from the Lord attach itself to you, dear Rebecca! Only believe what GOD says!